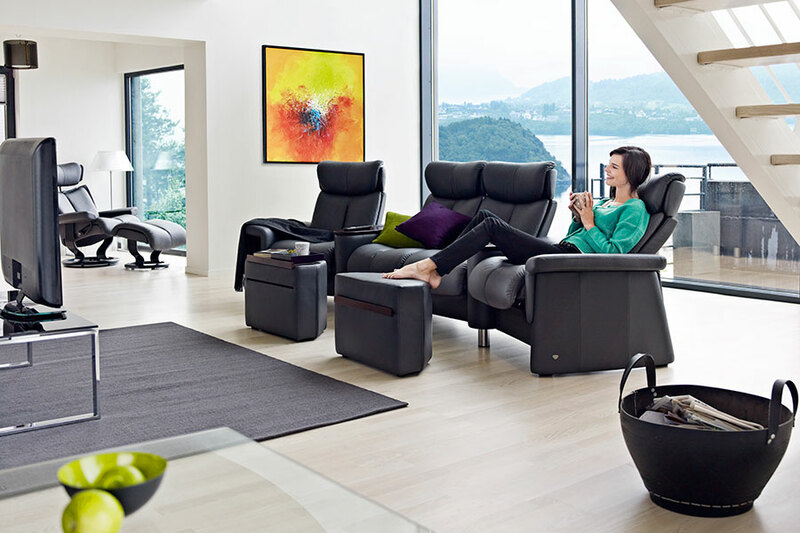 Creating an excellent custom home theater experience is easy with Stressless. 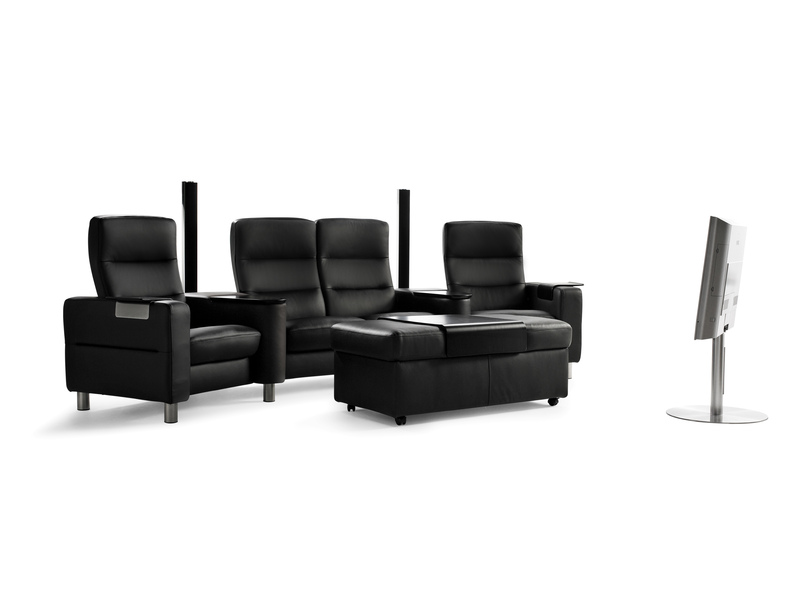 Whether you are enjoying your favorite DVD or experiencing live programming in 3D, we have the seating solutions that allow you customize your home theater just the way you like it. 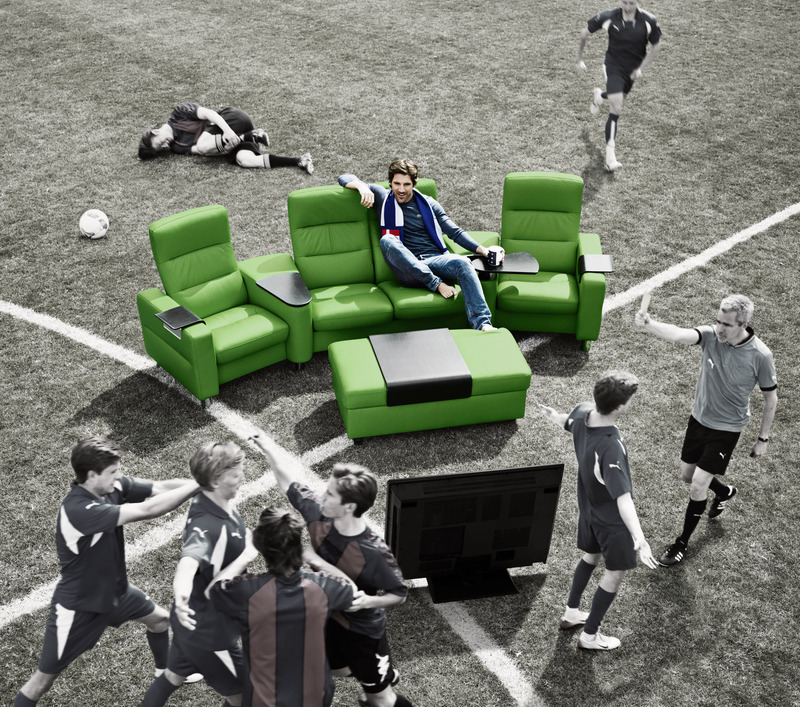 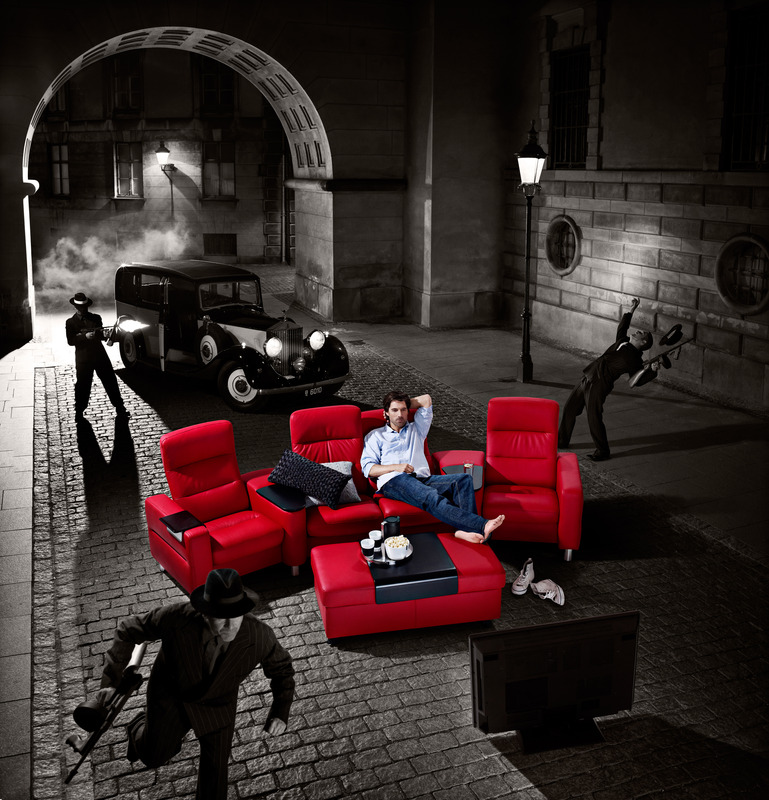 Choose the number of seats and how you place them to match your room, audio system and flat screen. 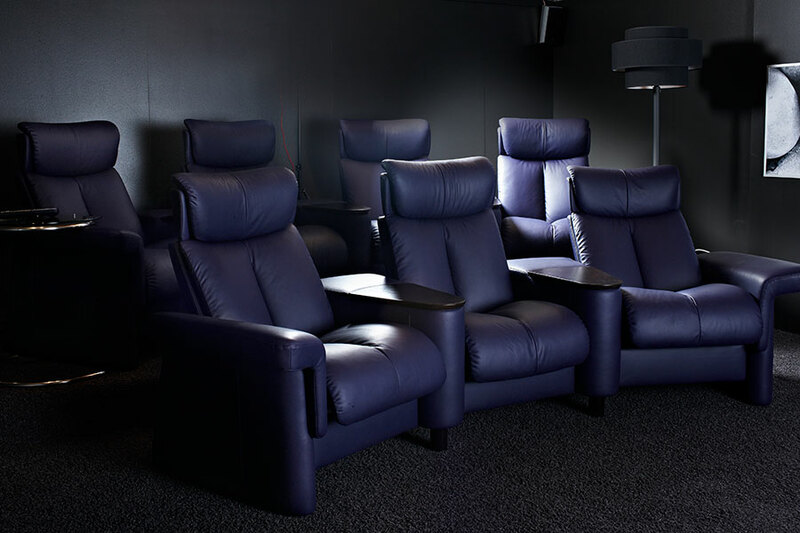 With our home theatre seating, you get our patended Stressless Plus and Glide systems that let you recline the seats and adjust the headrest and lumbar support for perfect comfort. 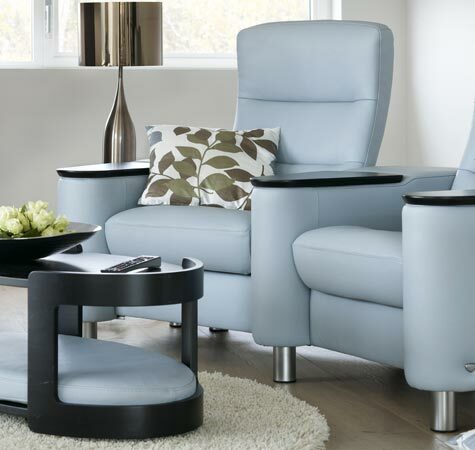 Not only does it look great, it's tidy and smartly designed so that everyone has a table within reach, and the Ottoman doubles as a footrest and table with a cleverly hidden storage compartment. 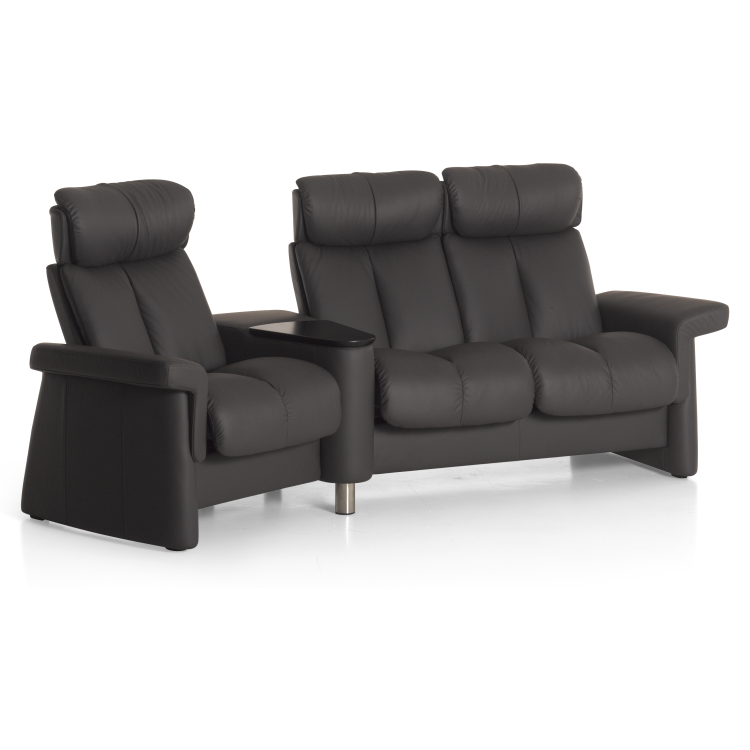 With Stressless comfort you are free to enjoy your entertainment in the ideal viewing angle with lumbar support that takes you through the longest blockbusters or TV marathons. 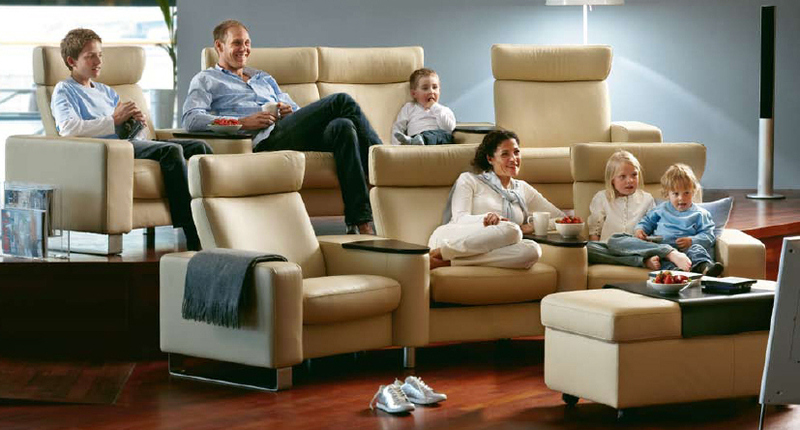 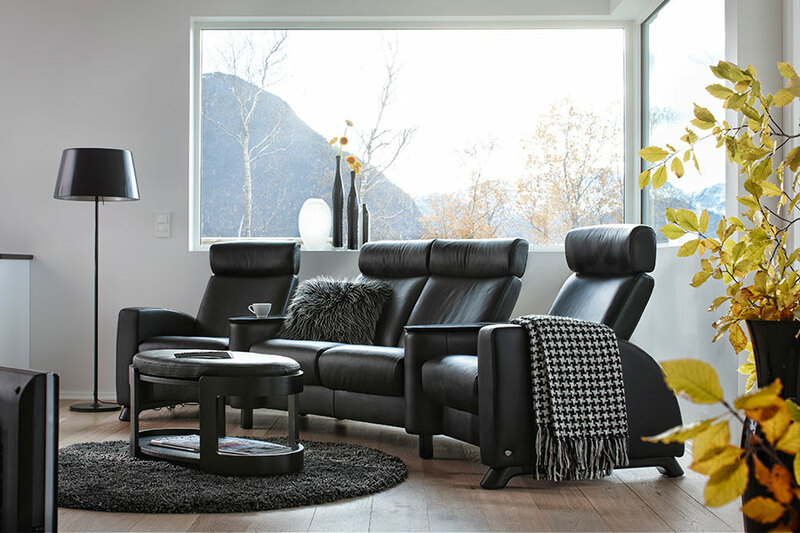 If you want to try one of our comfortable home theater solutions today, visit on of our local retailers.Ekornes.com/us is the leading brand web site to find home theater seating, sofas and recliner chairs. 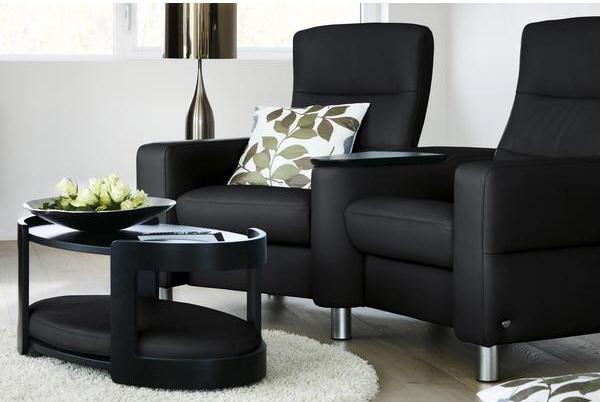 Be sure to check out our Stressless pages to find matching accessories, tables and other fine Stressless recliner furniture. 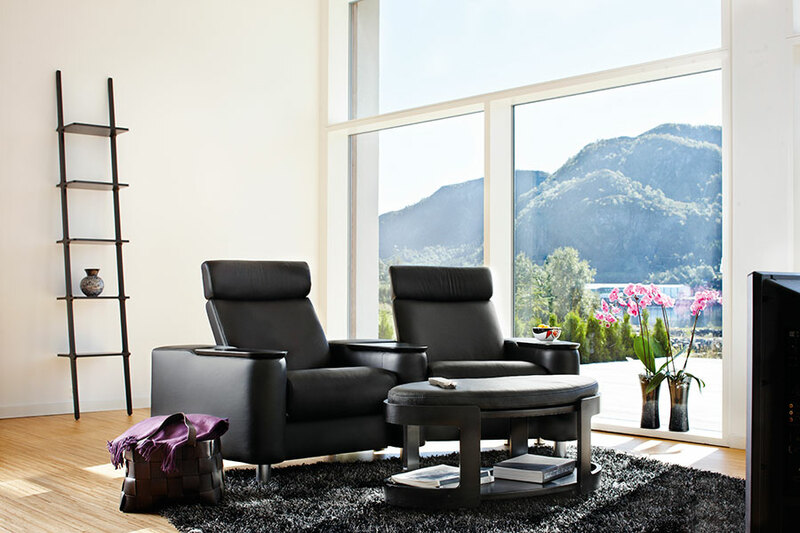 You will find all the information you need to make your purchase, including product measurements, warranties and where to buy Stressless. 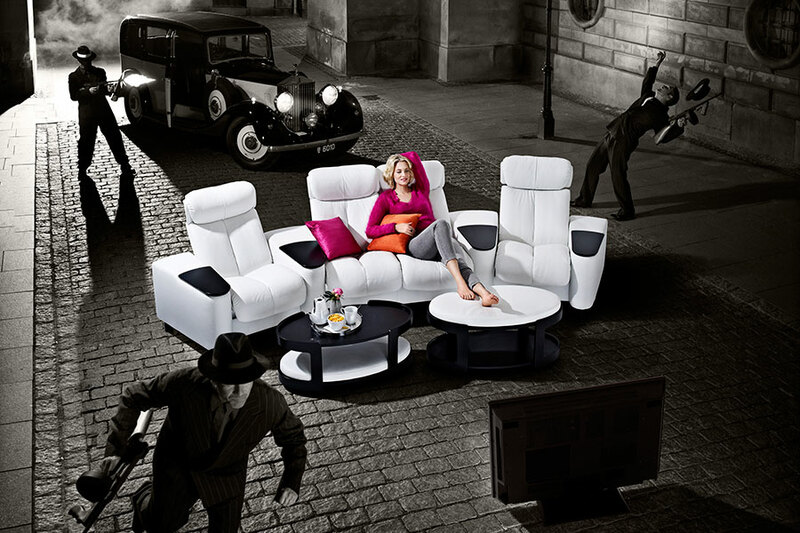 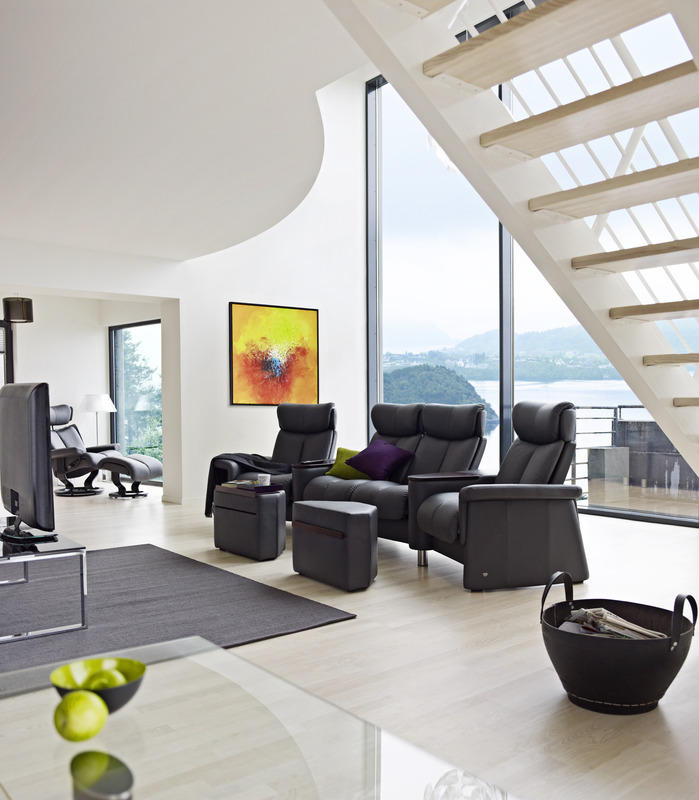 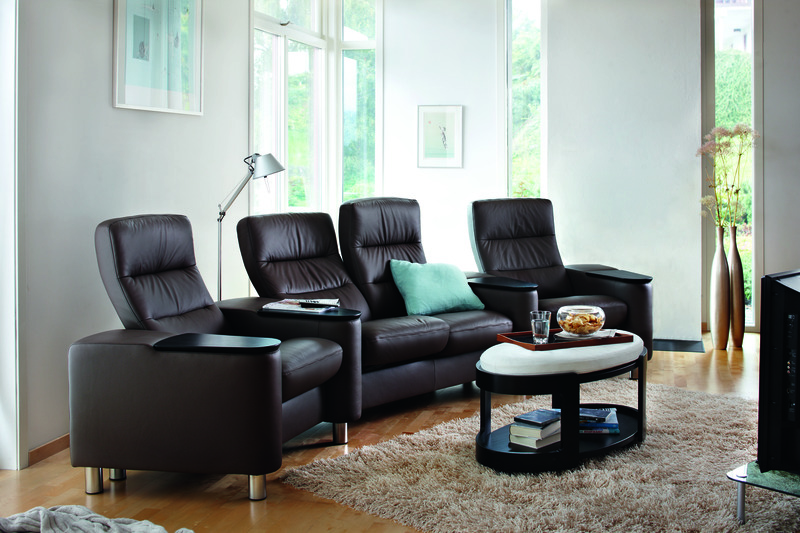 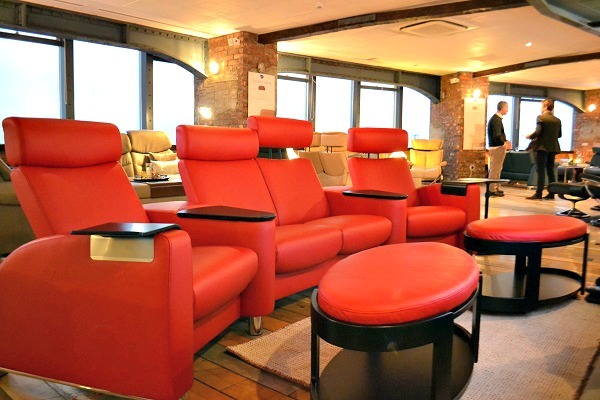 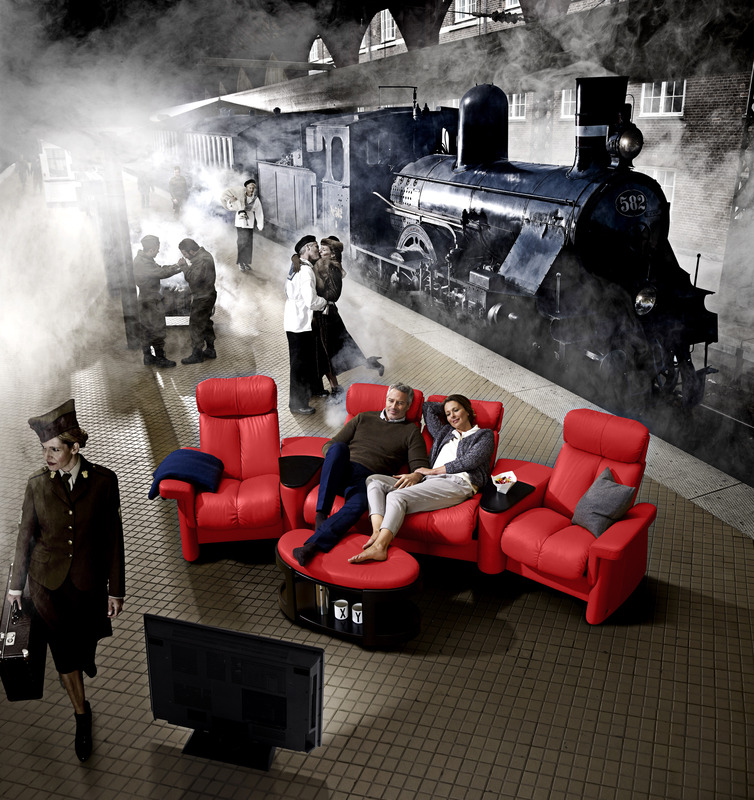 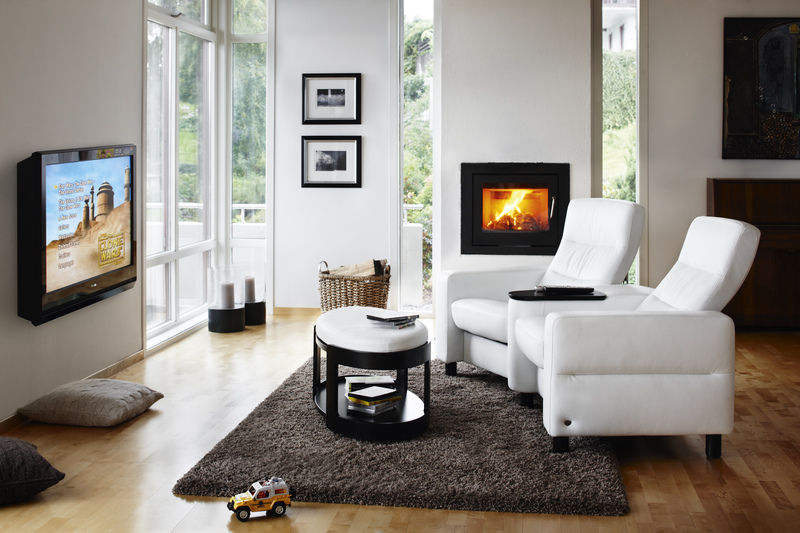 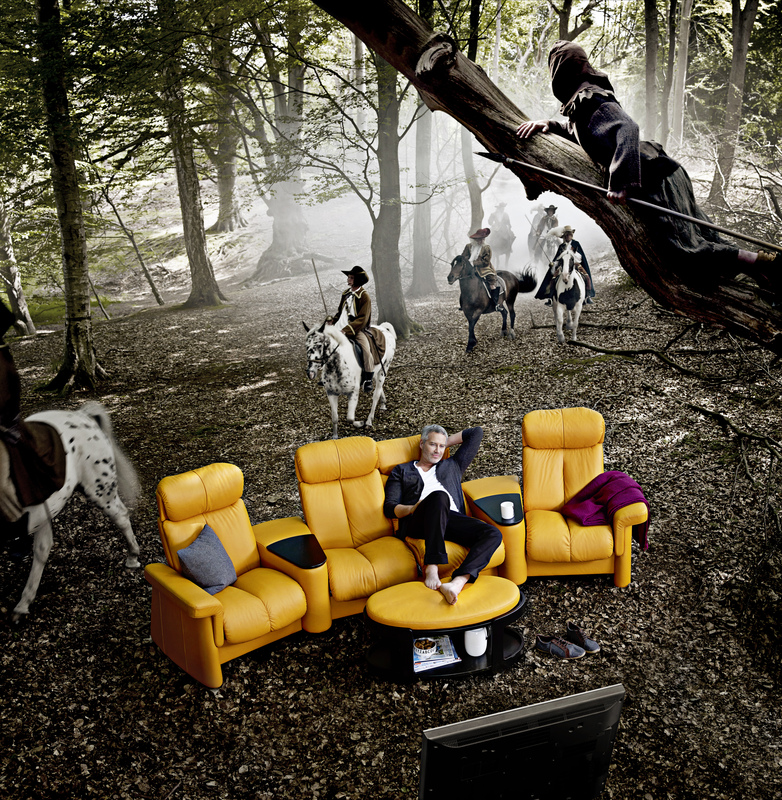 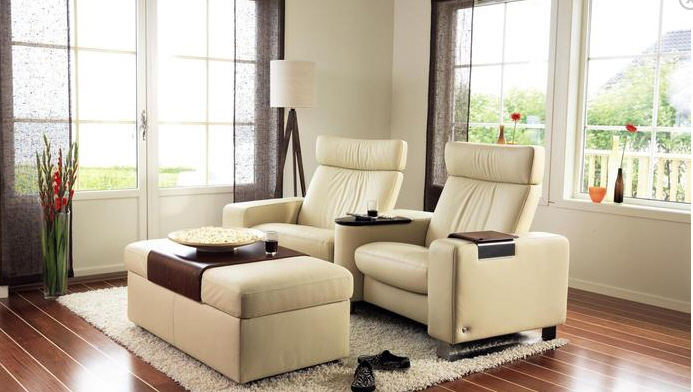 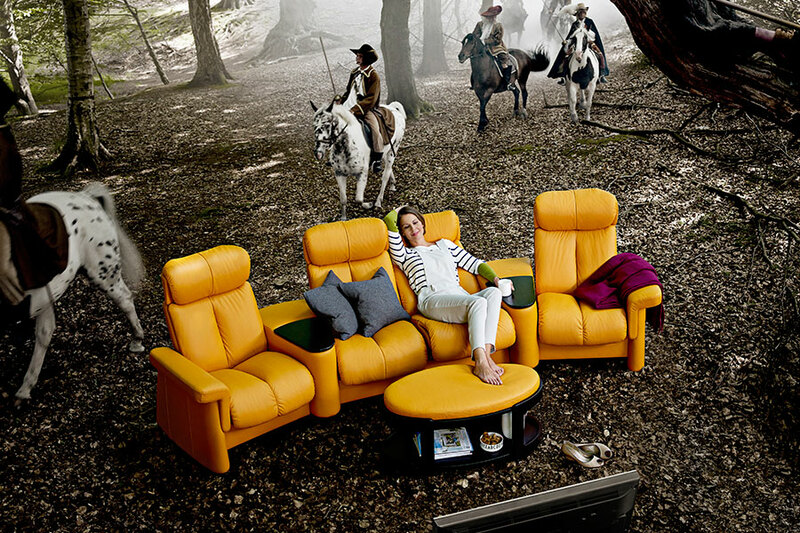 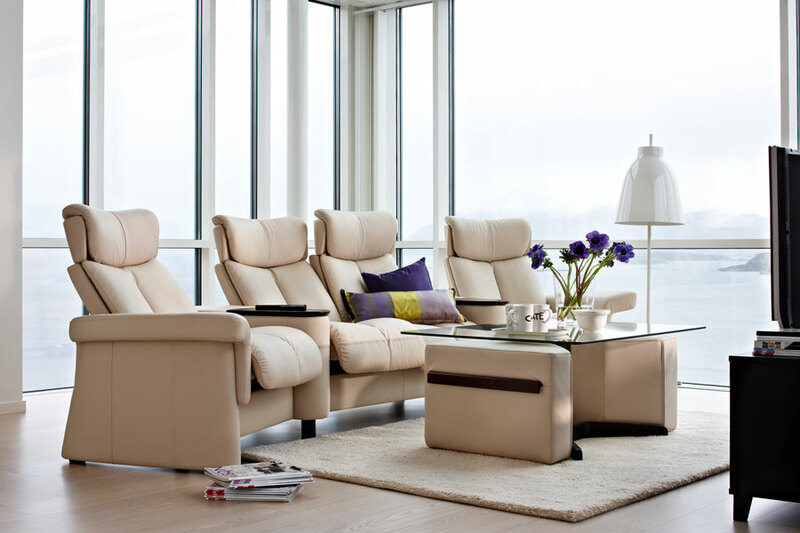 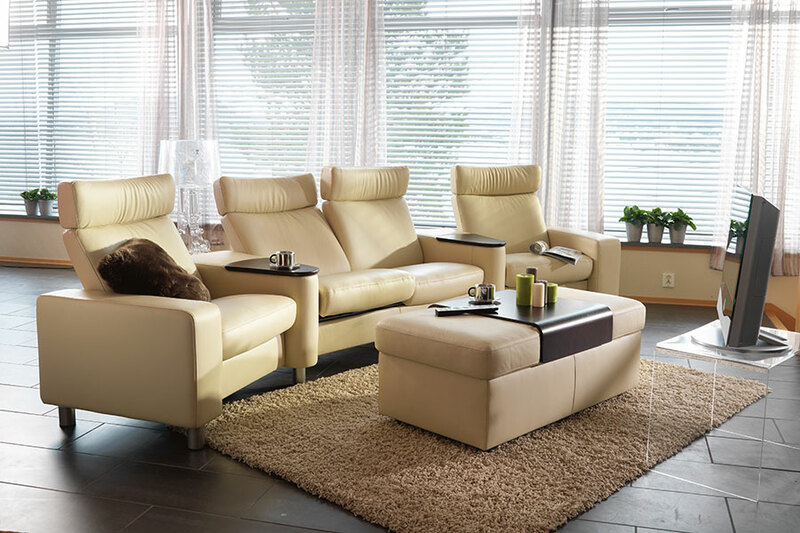 Stressless® Arion The Stressless Arion is a modern classic in home cinema design and comfort. 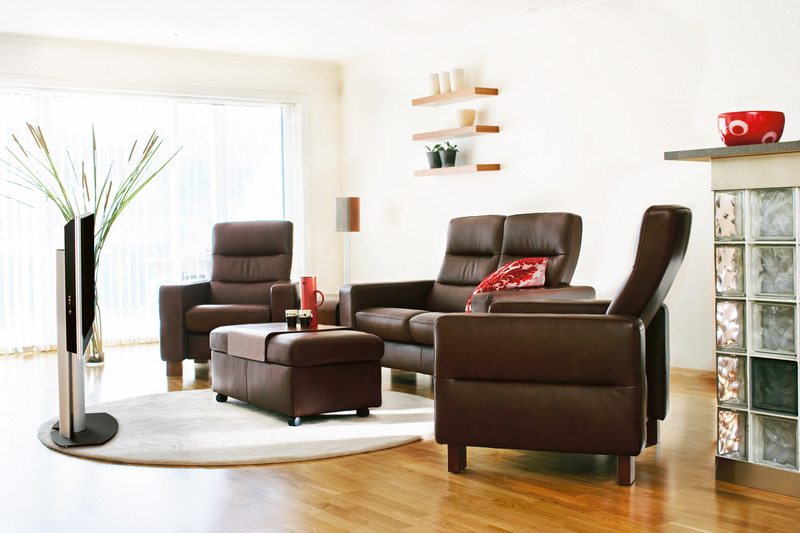 The Arion is available in a 3-seater sofa, 2-seater sofa, and chair. 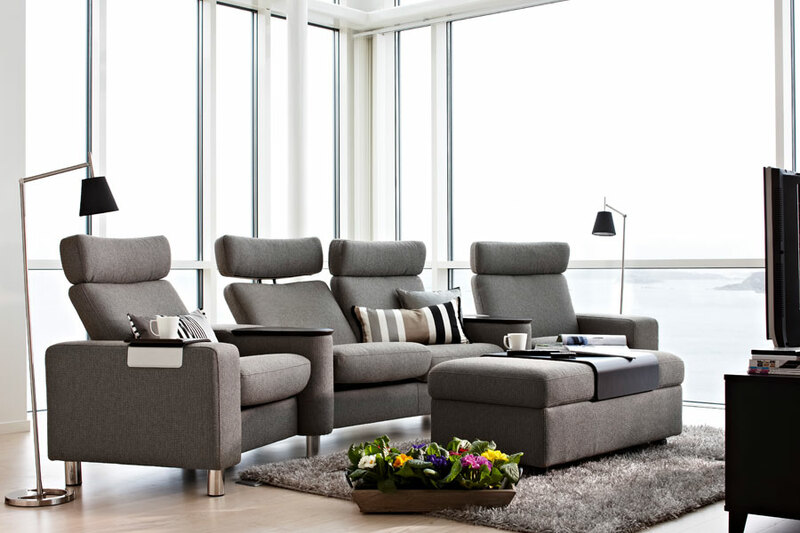 You can choose between tall and low-back options. 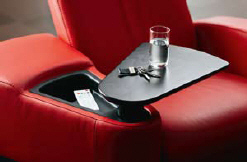 All seats recline to accommodate your comfort. 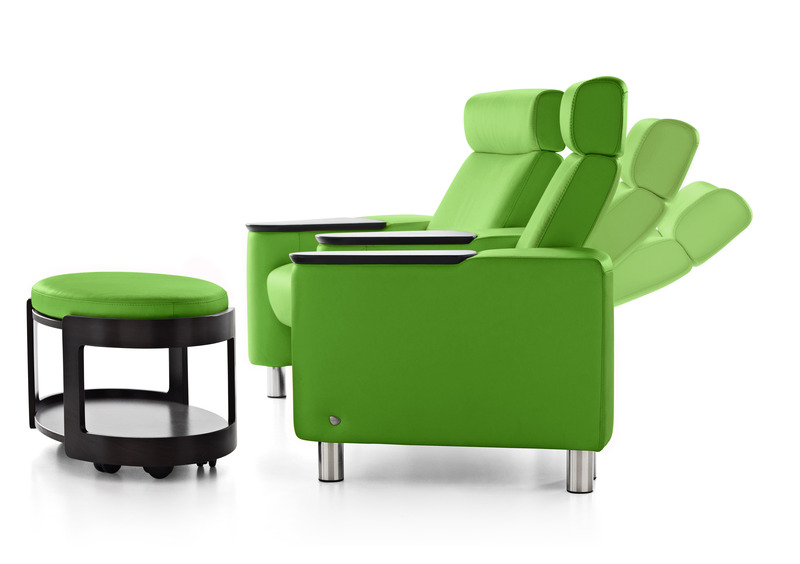 By using the Sector armrest as a connector, you can design your own solution according to space requirements and the number of seats you desire. 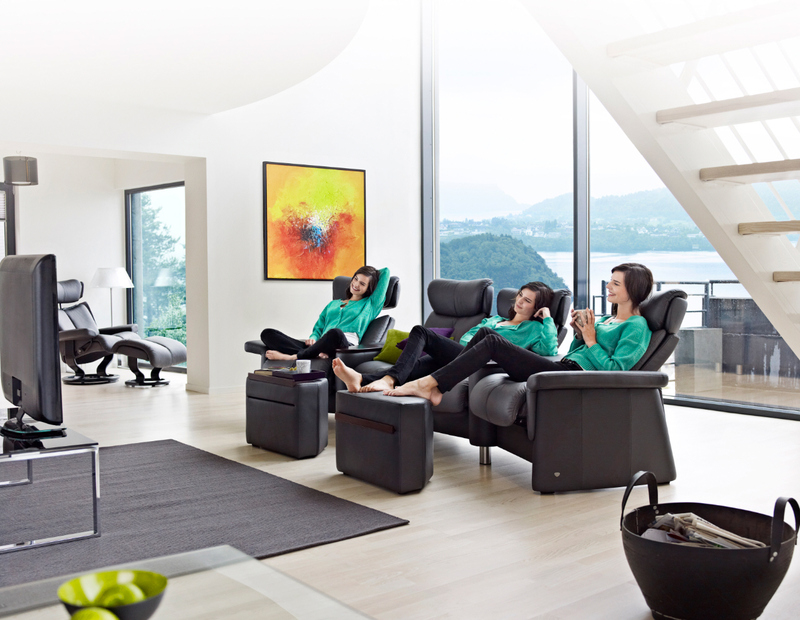 Stressless® Wave The elegant curves of the design gave the Stressless Wave its name. 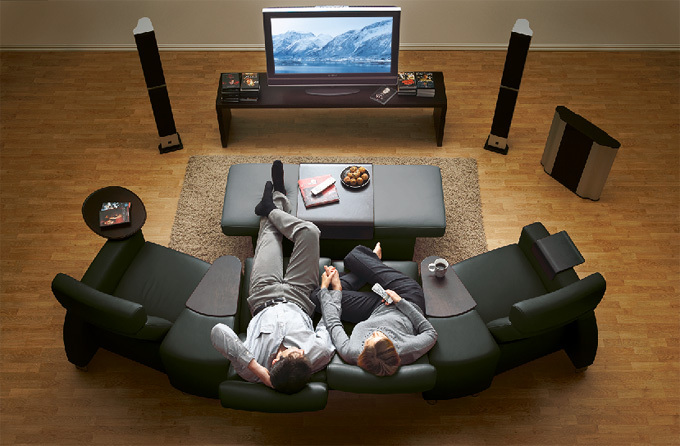 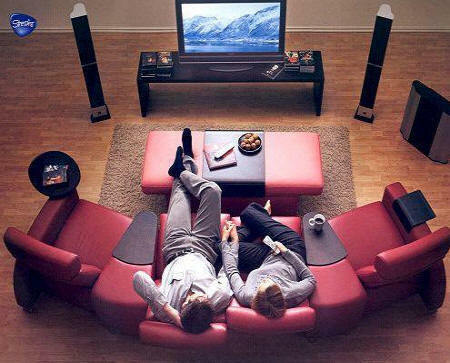 The Wave is a softer version of modern design home cinema seating. 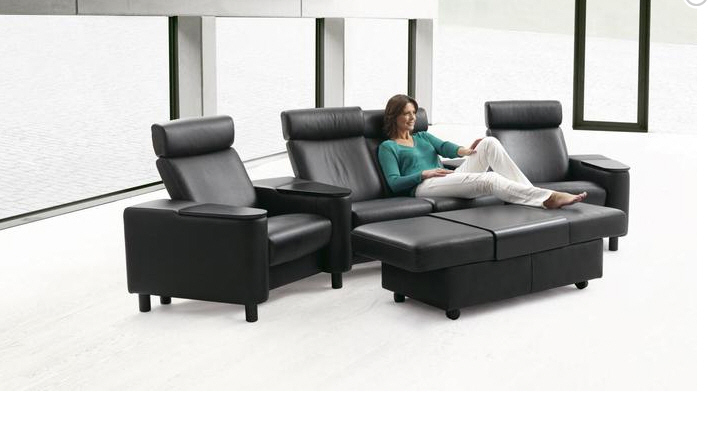 It's available in a 3-seater, 2-seater and chair, which you may combine in any arrangement using our Sector armrest to connect seats. 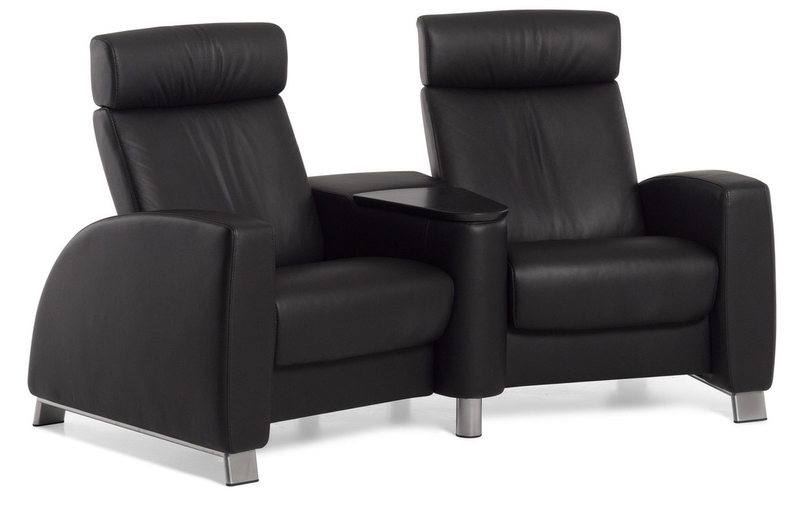 The Wave comes in a low-back and high-back edition, and you may combine both in a seating arrangement. 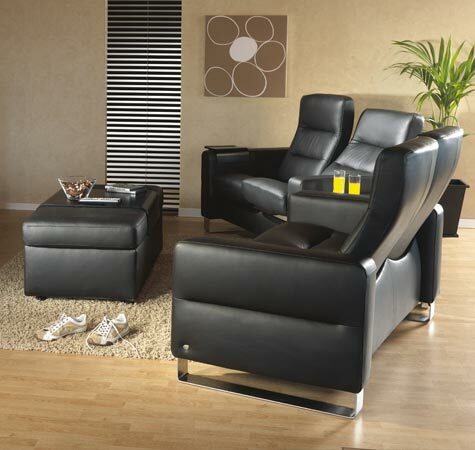 All seats recline to accommodate your comfort.